I love fruit and cheese as a combination. As a child at a party, you would always find me near the cheese and grape skewers. As an adult, I’ve grown to adore pear and goat’s cheese. Unfortunately, goat’s cheese is not allowable on the Specific Carbohydrate Diet (SCD) I plan on making my own goat’s cheese soon though so watch this space! When I saw the most delicious, juicy pears at our local farmer’s market I knew I needed to try this. 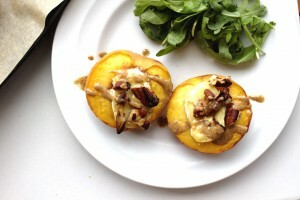 If you’ve been following my blog for a while, you’ll know that I love brie. I love it especially grilled or baked. 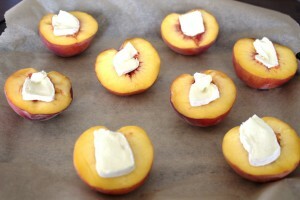 Baked peaches with brie cheese seemed like the perfect match for me and they are so good! 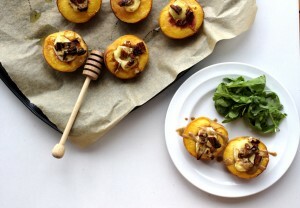 These work great either as an appetiser or party food. They are best eaten the day you make them though and won’t really work prepared in advance. They don’t take long though, so you can whip up a batch just when you need them. My goal with appetizers and party food always is to create ones that everyone will enjoy. If my husband will gladly eat my dishes then I know I’m onto a winner. 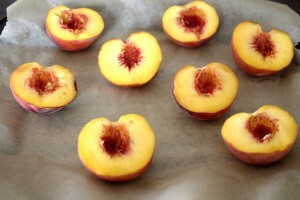 These baked peaches were a big hit. Nobody at a party will protest about gluten and grain-free dishes as long as they are delicious. If you think about it anyway, appetizers shouldn’t be heavy. You don’t want to eat lots of carbs just before tucking into a big meal. Win, win for SCD! Being on SCD can be so difficult and isolating at times. There is nothing I enjoy more than making delicious food that people love to eat just because it tastes good. That has always been and remains my aim with this blog. On my long and difficult health journey, SCD has been my salvation. Apart from the obvious health benefits, I have learned the value of being able to make nutritious food that nourishes. Meals made with love always taste better! These baked peaches are no exception.